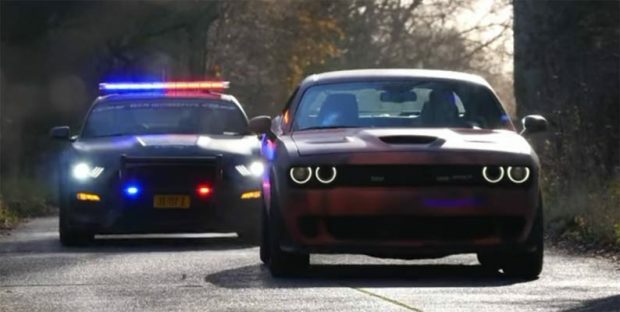 Here we have a Ford Mustang Shelby GT350 dressed up as a police patrol car and a Dodge Challenger SRT hellcat as the supposed bad guy in a matchup to see which muscle car can out run the other and a review of each car to boot. The video is actually a review of both vehicles, with just some added drama thrown in. Both vehicles look very cool in their respective outer shells, which makes you think it would make car reviews in general more interesting if they were dressed up a little more uniquely like these two. it doesn’t affect the review, but it does make for better eye candy. Luckily, English subtitles are available so you can follow along with the review, which isn’t just a great review video but also quite a cool review of both vehicles. Check it out.